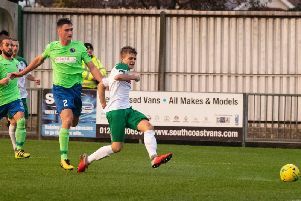 Jack Pearce has admitted the Rocks are favourites to be relegated from National League South – but said the aim would be to come back up next season. He was downbeat after a second home defeat inside four days as Welling won 3-1 at Nyewood Lane thanks to basic errors by his team that made it easy for them to score three times. Pearce maintained that some of Bognor’s football against Welling – and in the 2-0 defeat to East Thurrock that preceded it – was good. But he acknowledged that the problems they have shown at both ends of the pitch since the first month of the season had not gone away, and would always prevent a team from winning matches. The Rocks go toWeston-super-Mare on Saturday 13 points from safety with only nine games to play. Welling scythed through Bognor for two simple first-half goals then seized on a spill by keeper Dan Lincoln to go 3-0 up before a late Ibra Sekajja consolation. Pearce said: “Is there a black cat I’ve run over recently? Because if you look at their three goals, not one is a well-created goal. Each one is self-inflicted and down to poor principles of defending. “For the first we lost possession, the centre-half tried to play offside but if he’d stayed where he was he would probably have been able to mark the player who scored. So we went 1-0 down which, when your confidence is low, gives you a bit of a mountain to climb. “I thought we got back in it and then conceded the one just before half-time – and that’s two goals conceded from balls played inside full-backs. So we were 2-0 down at half-time but in terms of shots and possession in the first half we’d been equal to them. “At half-time we thought the next goal was going to decide it. If we could get to 2-1 we’d have a chance but if we went 3-0 down we’d cooked our goose. “We played a wonderful bit of football and how did Kristian Campbell missed from five yards? It was more difficult to miss than score. If it had gone 2-1 then it could have been quite an interesting second half. “Then (for their third) you had a player crossing a harmless ball into the box and your centre-half totally misses it, the keeper catches it and then drops it at the feet of their striker who can’t believe his luck and pops it in the net. “You could have Jose Mourinho or Pep Guardiola here, you cannot allow for mistakes of that nature. The individual mistakes are beyond belief. “And I thought for a team 3-0 down who are bottom of the league playing a team who are going for the promotion places, in the last 20 minutes we played some quite good football. But the six times we got into really great crossing positions, we didn’t really hurt them. “They won every header that came in, we hit the first defender with every cross, yet when you get into those areas you do have to hurt the opposition. And we don’t do it. “Dabba (Darin Killpartrick) has worked very hard on the training ground but in football there are two main areas – the penalty areas at both ends. And unfortunately in both those areas, we are not good enough. Pearce admitted the Rocks’ problems at both ends had been a ‘pattern’ since August that had been difficult to eradicate. Talking about Lincoln, Pearce said: “For their third goal it’s a bad error. He knows that. He doesn’t mean to do it but it’s the sort of thing that happens when you are struggling. “Some of our football was very good but there was no end product and if there’s no end product it’s frutrating for everyone. “It would have been very easy for us to have folded and got four, five or six against us but I thought we showed good attitude to the job, especially after Saturday. We were poor Saturday for 20 minutes and then did okay. Pearce admitted it looked like relegation would be confirmed and said in a lower league, more players would be available to the club. But he added: “If we do go down the challenge will be to come straight back up. And if you come straight back up, you’ve got to make sure you overcome the same problems you are coming up with this time. Is there still hope of staying up this season? Very few fans, if any, think so and Pearce said: “If you were a betting man, we are favourites to go down and the bookies aren’t often wrong. Mathematically we can but our home record is abysmal. I’m aware of that, I’m not stupid.